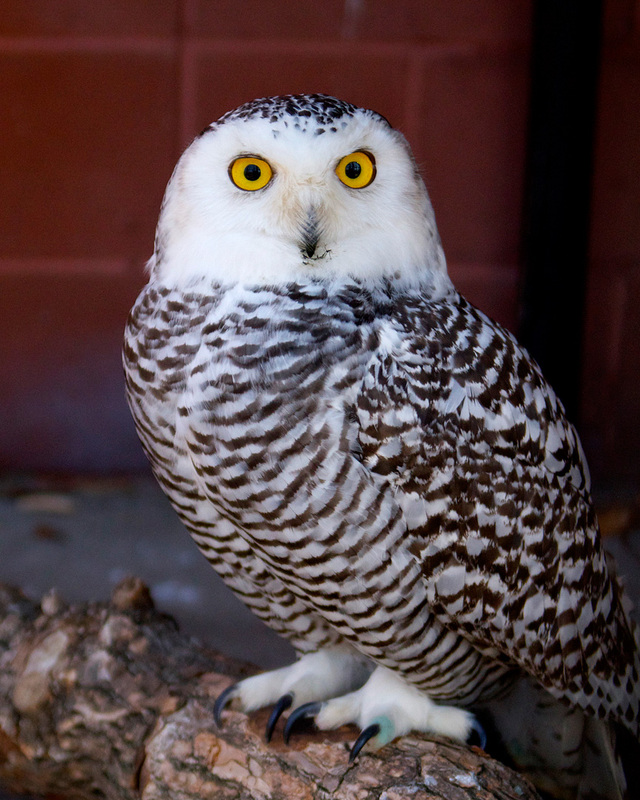 The Snowy Owl is the heaviest North American owl, and one of the largest in overall size. They may be 20-27 inches tall, and have a wingspan of 5.5 feet. They have large, round heads, black beaks, no visible ear-tufts and yellow to orange-yellow eyes. Females are larger than males; females average 5 pounds, males 4 pounds. The female’s body is white and highlighted with dark brown bars and spots. Males are nearly pure white. Both sexes of immature owls are heavily marked with brown barring. The Snowy Owl prefers open areas for its breeding range, including tundra and grasslands. During winter it seeks open areas to the south, including prairies, marshes or shorelines. This circumpolar owl inhabits tundra regions of Eurasia and North America. During the fall and winter, it migrates to southern Canada and northerly parts of the United States (including Connecticut). During years when high numbers of owl young are produced, the Snowy Owl may wander as far south as the central United States. Primarily lemmings, mice and voles. They also eat large birds and a variety of waterfowl. Snowy Owls have been known to wade into water to catch marine animals with their talons. Up to 10 years in the wild and up to 28 years in captivity. Courtship begins in May, males perform aerial displays of dives, soars and exaggerated wing beats. They often carry a dead animal in their beaks as food gifts for prospective mates. On ground, males may spread their wings to impress females. Once paired, the owls nest on a prominent, elevated point that offers a good view in all directions. An average of seven eggs are usually laid, but clutch size may be even larger if prey is exceptionally plentiful. During periods of little prey, owls may not nest. Their incubation period is 32-34 days. The female incubates and broods, while the male hunts for food. 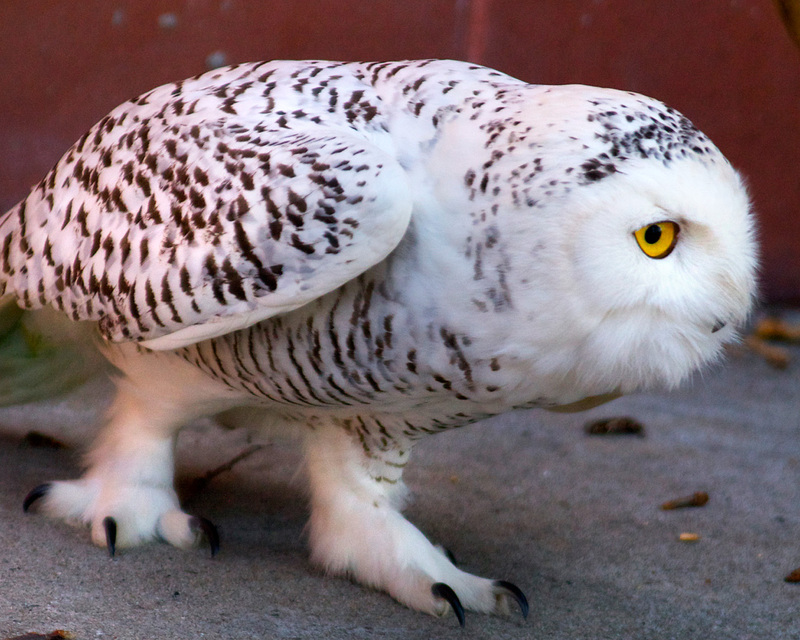 Snowy Owls are a species of Least concern. Locally abundant during good lemming years, rare at some locations during other times. Many cultures around the world revere the Snowy Owl as a living symbol of the raw beauty and power of the arctic. It is know by many names including: Snow Owl, Arctic Owl, Great White Owl, Ghost Owl, Ermine Owl, Tundra Ghost, Ookpik, Scandinavian Nightbird, Highland Tundra Owl and even The White Terror of the North. It is also the official bird of Quebec.